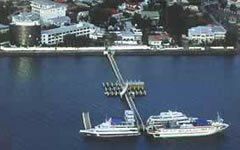 The Hotel Radisson Fort George in Belize City is a premier hotel with 102 deluxe rooms overlooking the Caribbean Sea. The hotel and its marina offer modern facilities in recently renovated classic colonial ambience. The Radisson’s professionally trained Belizean staff welcomes you with the traditional “yes I can” attitude of Belize. The Hotel is ideally located close to markets, business areas, local government offices and foreign consulates. Along with various conference facilities the Hotel Radisson also offers a full-service marina accommodating ships up to 250ft. in length and up to 10ft. draft. Communication with the marina is possible at any time on channel 68. All rooms were recently renovated and include air conditioning, cable TV, clock/radios, irons/ironing boards, coffeemakers, private bath with hairdryer, mini-bar, direct dial telephone and Internet data ports. Some rooms have balconies, some offer ocean view. Club Wing rooms all feature in-room safes. The Hotel Radisson features two pools and several restaurants and bars that take pride in serving a variety of delicious dishes, from fresh local seafood to appetizing Belizean and International specials.